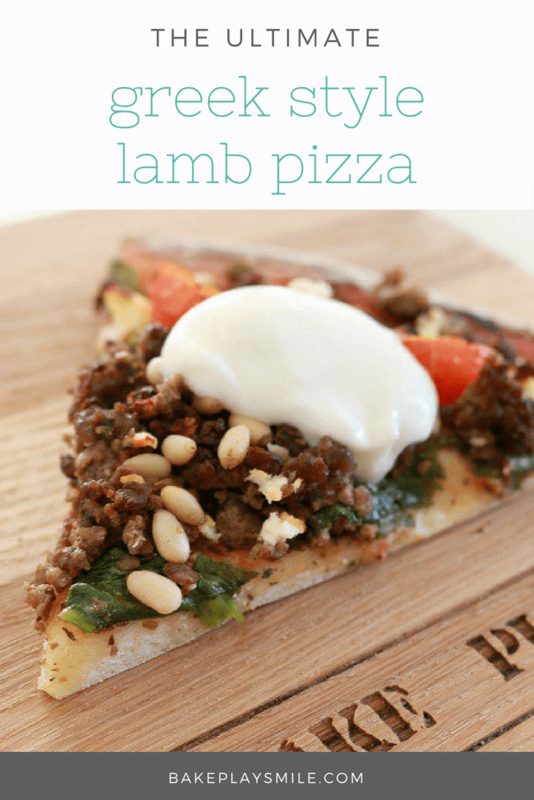 Friday nights have never been more delicious with this Greek Style Lamb Pizza. 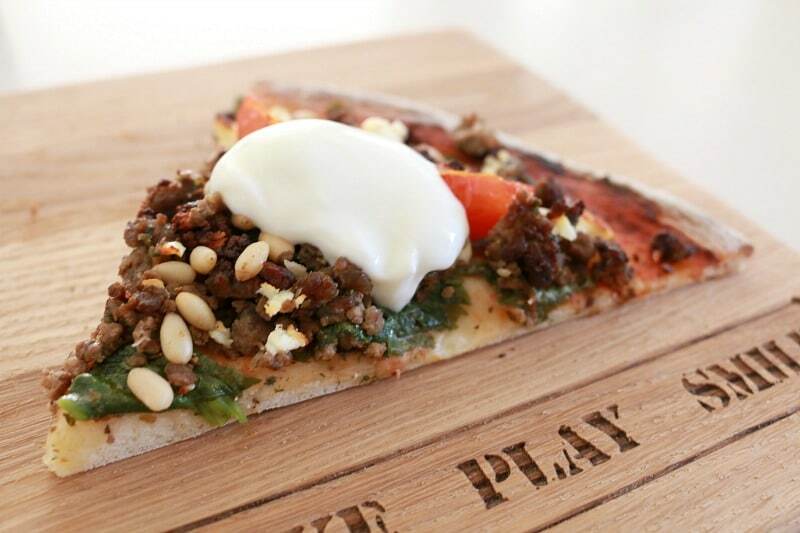 Made with lamb mince, baby spinach, cherry tomatoes, feta and pine nuts… you’ll be coming back for more! In our house, we’re big fans of pizza. I actually love it double as much because Dave is our official pizza maker… which means I can just fluff around pretending to be busy. And as much as I hate to admit it, he’s a much better pizza maker than me. Usually we (and by we, I of course, mean Dave) make our all-time favourite Prosciutto, Bocconcini and Rocket Pizza (OMG it’s the BEST thing ever! ), but sometimes we mix it up a bit. Often we’ll make a Greek lamb pizza with leftover roast meat.. but this time we decided to change things around a bit and use lamb mince. 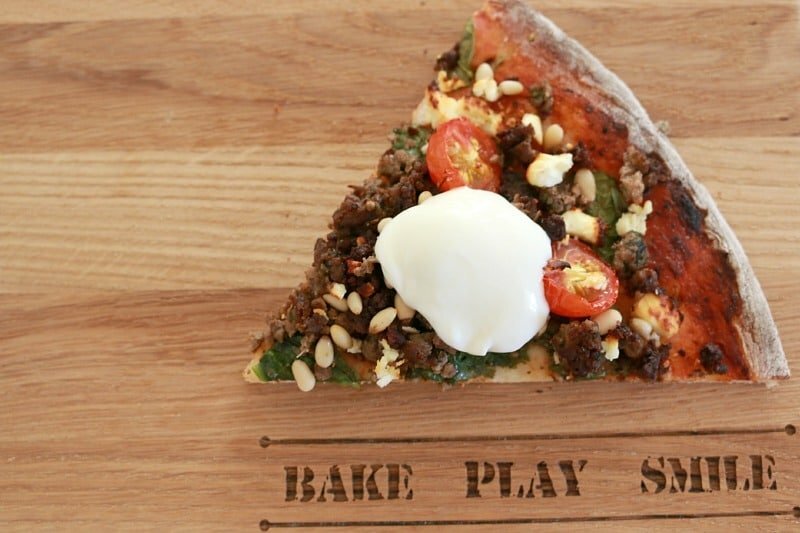 This is a messy-awesome-totally-delicious-kinda-pizza. I had bits of mince falling everywhere, but dear oh dear, it was really, really good… so who on earth cares if it’s messy! Messy food is good food… just ask a bowl of nachos. 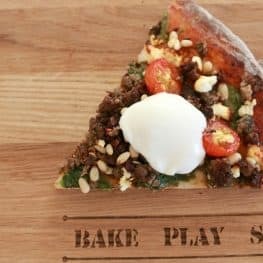 To make this lamb pizza you need to whip up a basic pizza dough. If you’ve got a Thermomix, it will save you a ton of time, but if not, don’t stress – your hands will work just as good. And Dave tells me that there’s nothing better than making your own pizza dough by hand. Seriously, that man should have been born in Italy. Then it’s simply a matter of browning off some lamb mince with some yummy garlic and herbs and spreading over a bit of pizza sauce. Add a handful or two of baby spinach, the cooked lamb mince, a good sprinkle of crumbled feta and the halved cherry tomatoes, and then pop it into the oven. When there’s about 5 minutes cooking time remaining, toss over a handful of pine nuts. Serve with a sauce made from greek yoghurt, lemon juice and garlic (it’s also very yummy is you add in a little chopped mint!). This lamb pizza may just become a new Friday night favourite at our house. 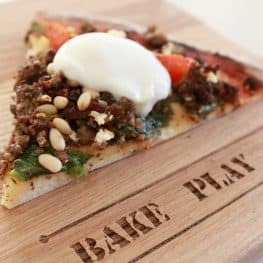 Greek Style Lamb Pizza made with lamb mince, baby spinach, cherry tomatoes, feta and pine nuts... you'll be coming back for more! ½ cup warm water you may need a little more! Preheat oven to 200 degrees and lightly spray a pizza tray. Add the sugar, salt and oil. Put the yeast sachet into the warm water and leave for a few minutes (or until frothy). Mix together. Pour the yeast liquid into the flour and mix together (add more water if needed). Knead on a floured board into a nice ball. Place in a bowl floating in a sink of hot water (don't let any of the water into the bowl) and cover with a tea towel. Leave for 20 minutes to rise. Place the dough onto the tray. Spread the baby spinach leaves over the base. Meanwhile, heat the olive oil in a frying pan over high heat. Add the lamb mince and minced garlic and cook until brown. Drain all of the excess liquid! 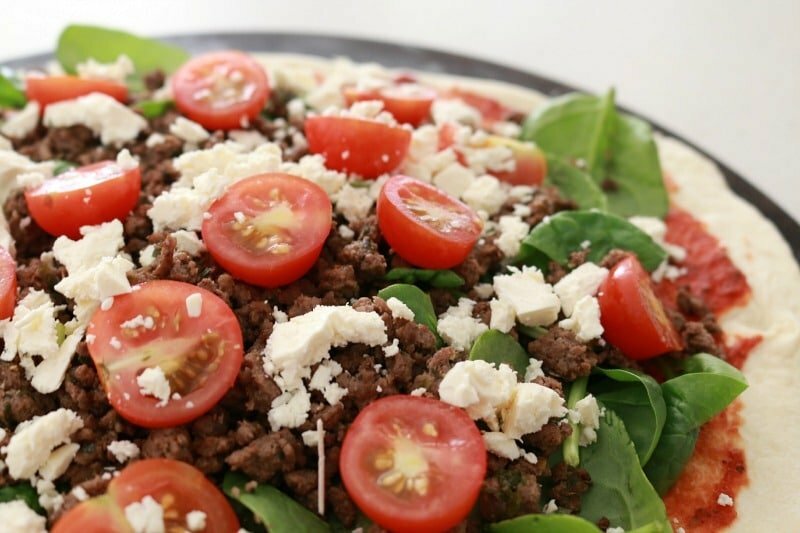 Heap the browned mince onto the baby spinach leaves and top with the halved cherry tomatoes and the crumbled feta. Cook in a pre-heated oven for approximately 10-15 minutes. When the base is nearly crispy, sprinkle over the pine nuts and cook until the base is ready and the pine nuts are just golden. Meanwhile, combine the greek yoghurt, lemon, mint and garlic in a small bowl. Serve the pizza with the sauce. Heat the yeast and water for 1 minute on 37 degrees, Speed 1. Add all of the other dough ingredients and mix for 6 seconds on Speed 6 and then knead for 1 and ½ minutes on interval speed. Proceed as per conventional instructions. Roll out the dough to make a large 32cm dough circle. Is it bad that I want to have this for breakfast? The pizza sounds so tantalizing, Lucy! I totally agree with Dave about making your own pizza dough by hand. Yes I think he’s right! It really is yummy! Thanks Kat! It’s definitely a Friday night fave here too! This is a delicious combo, isn’t it? I wish every night was Pizza night!